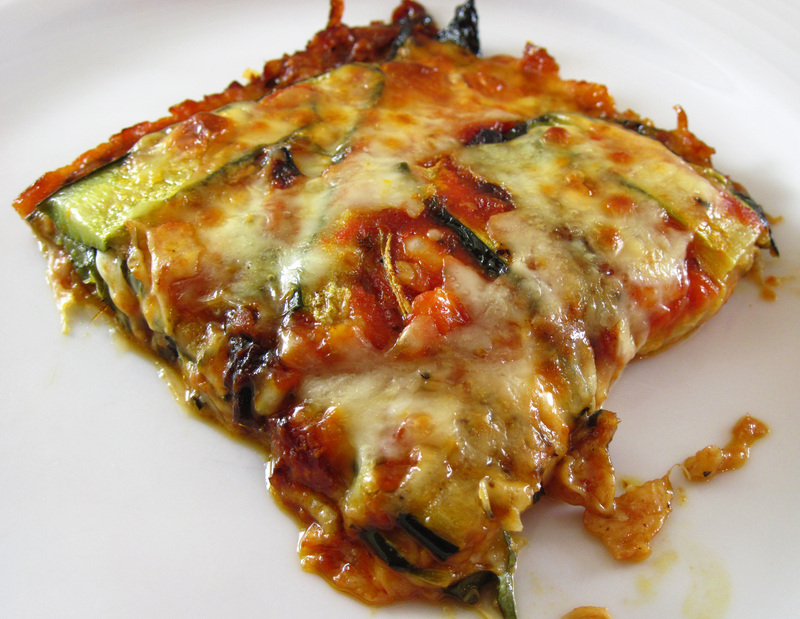 Roasted Zucchini Torta with Tomatoes and Mozzarella is a wonderful vegetarian main course. It’s easy to make and leftovers reheat beautifully. It makes a great lunch to pack for school or work the next day. 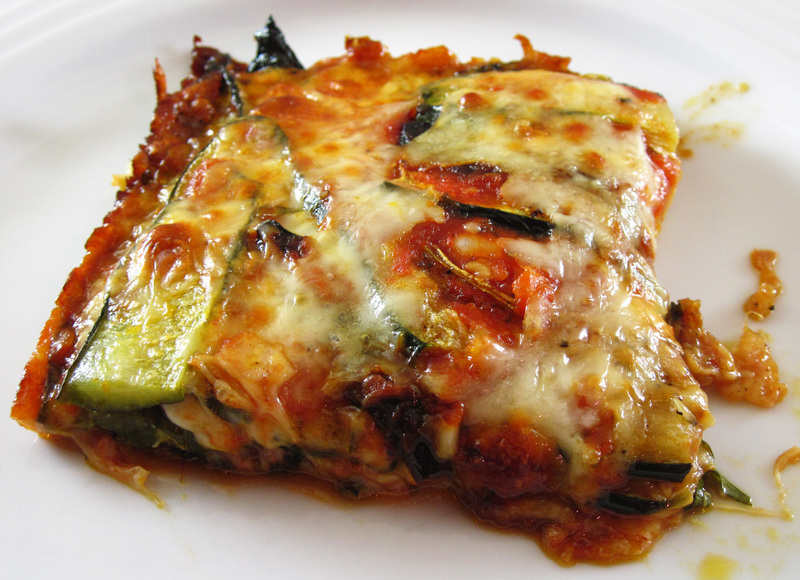 The recipe is adapted from Jack Bishop’s recipe in The Complete Italian Vegetarian Cookbook. 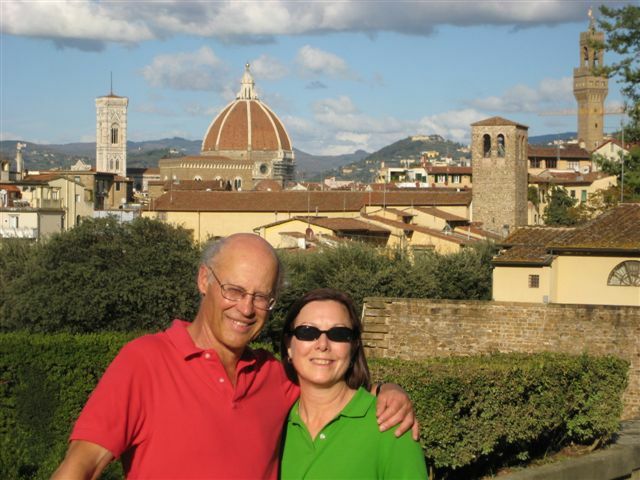 He makes a quick tomato sauce with canned crushed tomatoes, garlic, and basil. I substituted my favorite jarred marinara sauce, Mezzetta Homemade-Style Marinara Sauce. 1. Preheat the oven to 400˚. Arrange the oven racks so they are both in the center area of the oven. 2. Trim the ends off of the zucchini. Make a thin lengthwise slice off the side of one of them. Turn it on the cut side so it’s stable and cut it lengthwise into ¼-inch slices. Repeat with the other zucchini. 3. 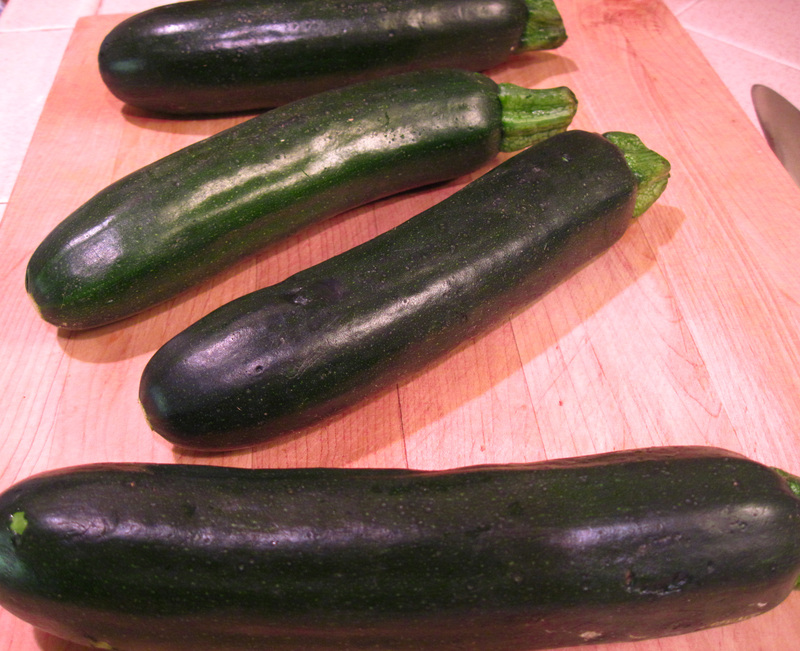 Lay the zucchini on 2 large rimmed baking sheets. Use about 2¼ tablespoons of olive oil and lightly brush the oil on both sides of the slices. Sprinkle with a bit of salt and pepper. 4. 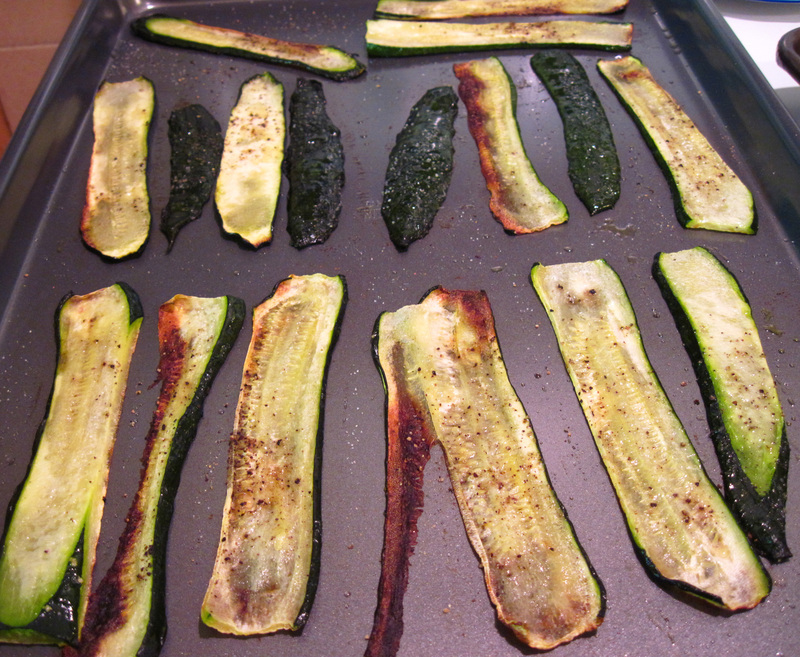 Roast the zucchini in the oven for about 15 minutes. You’ll probably need to use both oven racks. After 15 minutes, switch the baking sheets on the racks and roast for another 10 minutes, or until the zucchini is starting to brown. Remove from the oven. 5. Reduce the oven temperature to 350˚. 6. Brush an 8-inch square baking pan with a bit of olive oil. Put a layer of about ¼ of the zucchini in the pan. 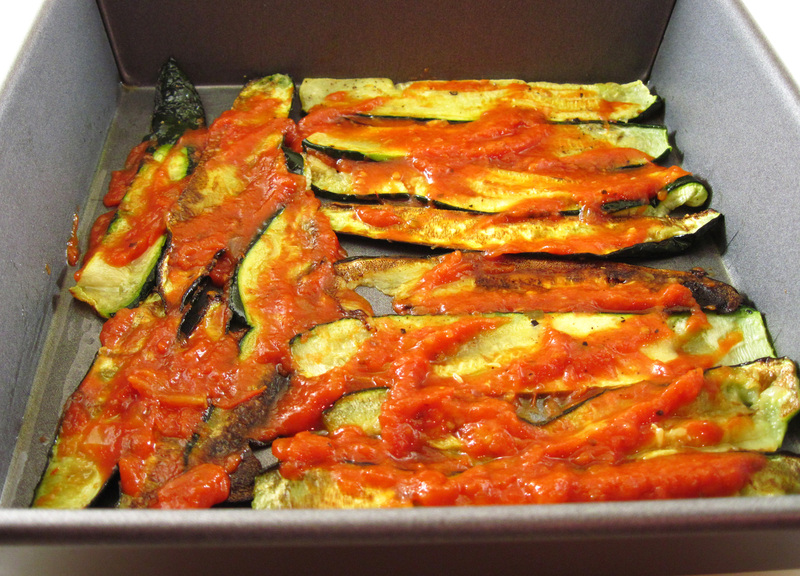 Brush ¼ cup of the marinara sauce over the zucchini. 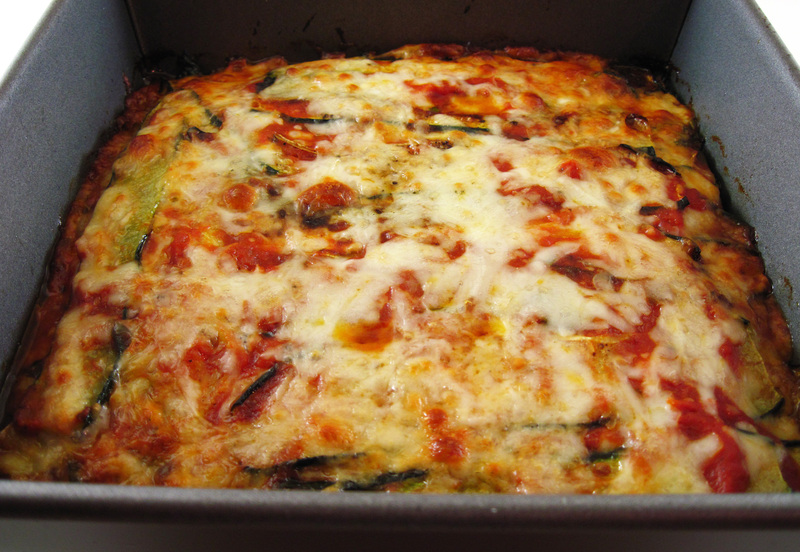 Top with ½ cup mozzarella cheese and a bit of the grated Parmigiano-Reggiano and the minced basil. 7. Repeat the layers 3 more times. 8. Bake the torta at 350˚ for about 30 minutes, or until it’s bubbly and has started to brown just a bit. 9. Cool a bit on a rack for 15 minutes before cutting into servings. Be still my heart!! I love zucchini! It says zucchini and tomatoes… so where’s the tomatoes? You have sauce but no tomatoes listed. ? ?